First came the Sokoban player. Then came the Sokoban solvers and the Sokoban optimizers. 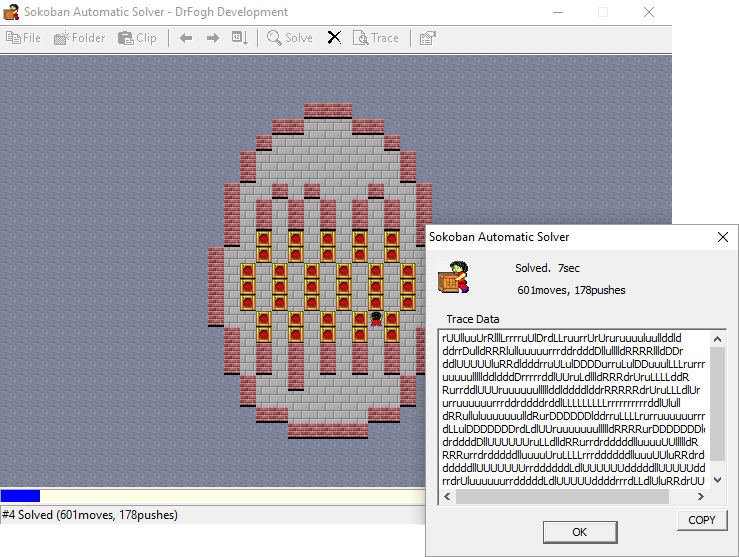 A solver is a program that finds a solution for a Sokoban level. An optimizer is a program that finds a shorter solution on the basis of a given solution. Probably the oldest solver is Rolling Stone, developed at University of Alberta, Canada, Department of Computing Science by Andreas Junghanns and Jonathan Schaeffer. Other noticeable solvers has been developed by Joris Witt and David White. And the now discontinued webpages of Paul Voyer and Adolfo Ovalle contained online Java Sokoban solvers. 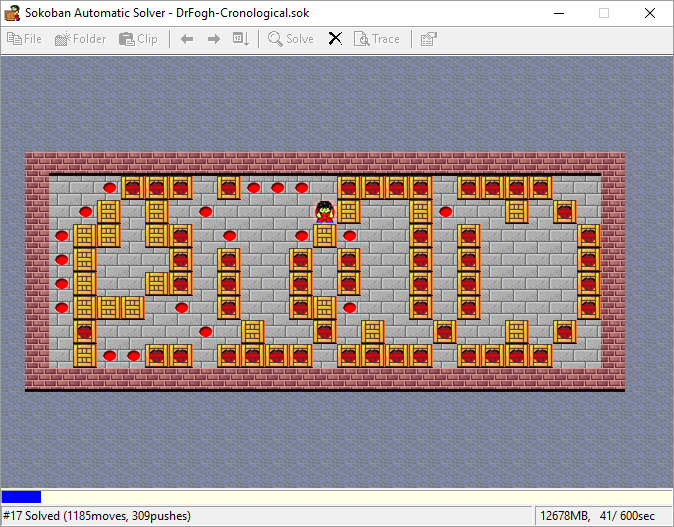 One more solver to mention is the solver developed by Ben Dogan for his Sokoban level design competition spring 2015. This solver is not available. A simple solver was developed 2008 by Pavel Klavik from The Czech Republic. Pavel is probably more known as author of the Sokoban program Armageddon. The solver in Matthias Megers Sokoban program JSoko. The solver continuously gets developed and updated. The solver YASS (Yet Another Sokoban Solver) in Brian Damgaards Sokoban program YASC. Also still further developed and updated. YASS is actually a plug-in that can be used in other Sokoban programs as well. An example is Jorit Wits Sokoban++. The third solver worth mentioning is Takaken developed by Kenichiro Takahashi. Development stopped 2008 but the solver is still very effective and beats the two newer solvers big in certain areas. More about that later. You will find a comprehensive test comparing the different solvers at Sokobano.de icon-star . The solvers tested was the last three mentioned and Boxsearch by Ge Yong. The website for Boxsearch is long gone and only found in The Internet Archive. The solvertest was last updated 2013 and both JSoko and YASS are improved considerably since then. You will find two optimizers: Again from Matthias Megers JSoko and YASO(Yet Another Sokoban Optimizer) from Brian Damgaard. Which solver and which optimizer are the best? I decided to make a small test with the solvers YASS, Takaken and JSoko and with the optimizers YASO and JSoko. First I solved the 10 levels in my collection “Numbers” with each solver. None of the solvers found a solution for “Four”. And all the solvers found solutions for the rest of the levels. Mostly within less than two minutes. JSoko took some time to solve “Seven” and “Eight”, but the job was done in due time. YASS had similar problems with “Zero”. Then I let the optimizers try to find shorter solutions on the basis of the solutions found by the three solvers. Red= Best, Yellow= A tie. Seems YASO is best at finding solutions with few moves and JSoko solutions with few pushes. I used standard settings except for setting solving timeout to one hour. It might be possible to obtain better results with other settings. Looking a little closer you will find the average results moves/pushes don’t differ very much. But not always. One remarkable difference is how YASO handles “Two”. 31 moves more with the YASS’ solution than the Takaken and JSoko solutions? Actually the basic solutions before optimization are quite different. YASS found a solution where the bottom of the level is solved first. 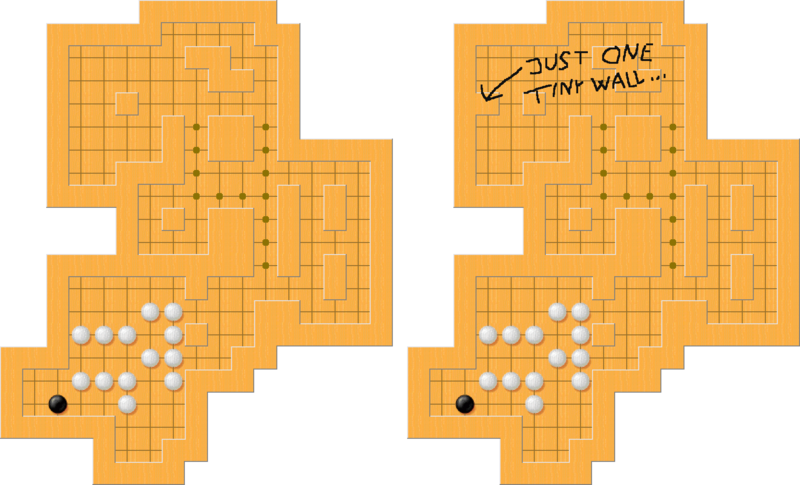 Takaken and JSoco found a solution where the top of the level is solved first. In this case, as probably in most cases, the optimizer doesn’t find a new solution but optimizes the first found solution. Didn’t check it out but in “Five” YASO obviously found the same optimization whatever the provided solution at first. And JSoko just as obivously didn’t do that. All my basic solutions and optimizations can be downloaded here if you want a closer look. I wanted to know if the latest versions of YASS and JSoko have improved from the Sokobano test 3 years ago. They have. Both solve several more levels. I just tested the results for XSokoban (The EASY Extended Original Collection). Why EASY ? Well, the small changes made in level 37 and level 50 makes these levels easier solvable both to humans and solvers. Takaken, YASS and JSoko find a solution for 37X (As in XSokoban). YASS finds a solution for 50X. Three differences that complicate matter. But what is important ? Actually I tried changing the differences one by one in every possible combination (Eight including the XSokoban layout). Solving the layout at left took YASS a fraction of a second. None of the solvers found a solution for the published “Four”. A human (me) hadn’t the slightest difficulty to go from the old layout to the new. I presented this to Brian Damgaard. Might give some inspirations to future versions of YASS. The problem was known. I am looking forward to see if future versions of YASS crack this level. Neither YASS or JSoko solved this old level of mine. Takaken needed 41 seconds. Same thing. Only Takaken succeeds. Today the solvers perform better but how much? Back in the 90’es solving of the “extended XSokoban original” was the golden standard. And Rolling Stone was king of the solvers. As far as I know. Not so anymore. The table below shows the results for the solvers tested at Sokobano.de plus the results for Rolling Stone 1998. Which solver and which optimizer are the best ? The solvers you want to use are YASS, Takaken and JSoko. And both YASO and JSoko optimizers. If you don’t use all the tools you can’t always be sure you have got the optimal solution for a level. The solvers might find a solution, but not necessarily the best. And the optimizers usually only improve known solutions. They don’t find new solutions. If you only used YASS you would think 262 was the moveoptimal result result for “Two”. And if you didn’t use YASS you would think 47 was the pushoptimal result for “Two”. icon-file-o Boxsearch – Get it here at Sokoban.dk. Website discontinued some years ago. icon-external-link Rolling Stone – For the ones with a Unix/Linux computer and historical interest. The skin? Nice. Isn’t it?